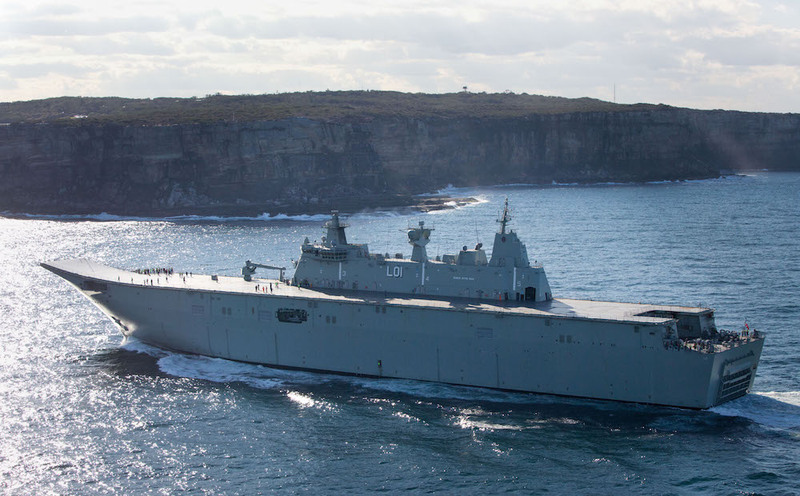 The largest ships ever built for the Royal Australian Navy (RAN), the Amphibious Assault Ships also known as Landing Helicopter Docks (LHD) were built by contractors BAE Systems Australia and Navantia. The ships provide the Australian Defence Force (ADF) with one of the most capable and sophisticated air-land-sea amphibious deployment systems in the world. Each ship is divided into 112 modules, which are built and fitted out as discrete units and then consolidated together to form the completed ship. This allows work on the ship to be completed at a number of different locations prior to assembly. There are 105 modules that make up the hull and seven modules that make up the superstructure. The construction of the hull to the level of the flight deck and the majority of fitting out was undertaken at Navantia’s shipyard in Ferrol, Spain. 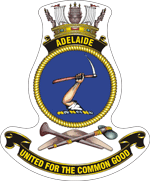 The work undertaken at the BAE Systems shipyard in Williamstown, Victoria, included consolidation of the superstructure and installation of the Combat and Communication Systems. 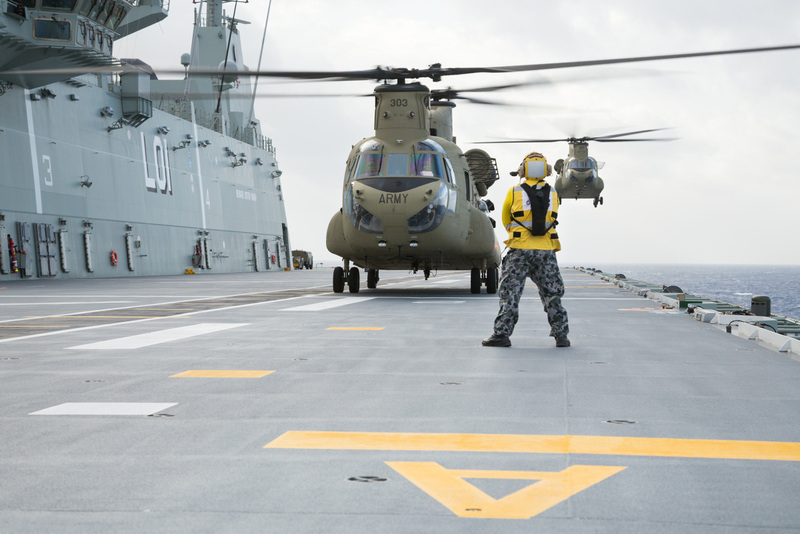 Leading Seaman Aviation Support Trent Gomm marshalls an Army CH-47F Chinook from C Squadron 5th Aviation Regiment, as another conducts a deck landing during training aboard HMAS Adelaide, off the east coast of Australia. The vessels can embark, transport and deploy military forces along with their equipment and supporting aviation assets. The ships have a conventional steel mono hull design with the superstructure located on the starboard side of the flight deck. They are designed with the shallowest possible draft to operate in secondary ports and harbours as well as manoeuvre in the shallow waters common in the littoral regions. There are four main decks; heavy vehicle, accommodation, hangar and light vehicles and flight decks. 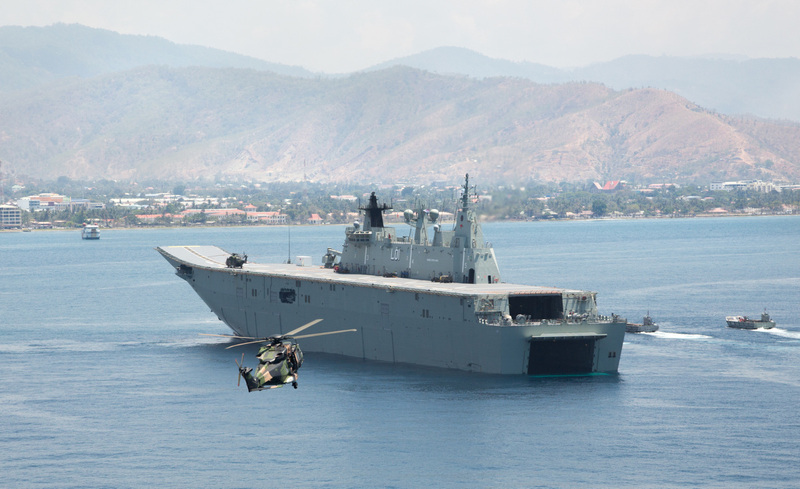 A MRH-90 Taipan helicopter delivers visitors from the Timor Leste government to HMAS Adelaide in Dili Harbour, as Navy and Army landing crafts depart to deploy a mobile hospital to Dili, Timor Leste, part of a Joint Task Group 661.1 response to a multi-national Humanitarian Assistance and Disaster Relief exercise. Purpose build water craft will enable transport of troops and equipment to shore, including where there are no fixed port facilities. The ships are equipped with modern Command and Control and combat systems including air and surface radar, advanced communications capability and surveillance systems. The ships are fitted with defensive systems and weaponry including an anti-torpedo towed system and gunnery. HMAS Adelaide (III) was commissioned at a ceremony at Fleet Base East, Sydney on 4 December 2015. HMAS Adelaide at sunrise before entering Sydney Harbour.